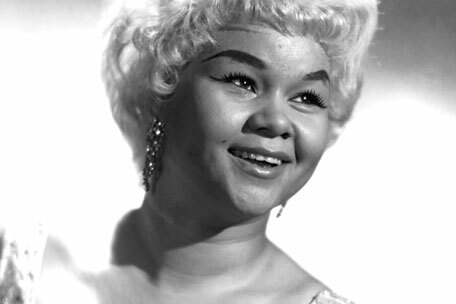 Well now this is sad news: blues singer Etta James died today. The singer, best know for songs such as “At Last” and “I Just Want To Make Love To You,” was 73 years old. She leaves behind a legacy of timeless, American classics. James was a major influence on singers both male and female. I have no doubt that there would be no Adele or Amy Winehouse without Etta James. Rolling Stone magazine ranked her 1961 album AT LAST! as #116 on their list of the 500 Greatest Albums of All-Time. In 2008 Beyonce Knowles portrayed her in the film CADILLAC RECORDS (which I must admit that I never saw, but I heard good things). I’ve spent many a Sunday mornings listening to Etta James on my record player. Her music really holds up, even more so with the current “retro” blues/soul revival that began with Amy Winehouse and continues today. There’s something magical about a lot of the music from the late 1950’s and early 1960’s. Singers like Frank Sinatra and Etta James seemed to have had a special bag of magic when they were recording, their work not only continues to thrive but seemed exist in timeless vacuum. She will be missed, but we’ll always have the music.